Upvc Hardware Limited, established as a family business in 1995, has now grown to be a nationwide market leader in the supply of hardware spares for UPVC windows and doors. 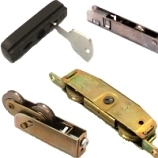 We supply hardware spare parts (Locks, Hinges, Handles etc.) for the repair of UPVC windows and doors across the UK. We stock parts from all the major uPVC hardware manufacturers including: Mila, Coldseal, GU, Avocet, Fuhr, Kenrick, Lockmaster, Maco, Saracen, Squire, Surelock, Wink Haus and Yale. 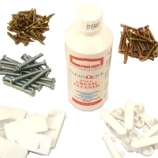 We offer bulk packs of popular items at even more discounted prices. See the Bulk Discounts and Special Offers pages for details. UPVC double glazing hardware parts now available at our sales counter located in Halifax (near Huddersfield) in West Yorkshire. If you're local, why not call in and see us? 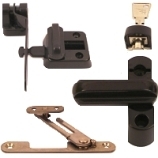 You can buy all types of upvc double glazing hardware spare parts from our sales counter. With a huge stock range we should have the part you need to repair your double glazed window or door. Our counter staff are trained to help retail customers as well as locksmiths, property maintenance companies and double glazing companies. The Contact Us page has our full address details. A security vulnerability has been identified in the design of standard euro lock barrels. Every PVC door with a standard euro cylinder lock is at risk, protect yourself by fitting the most secure euro cylinder lock barrel on the market. 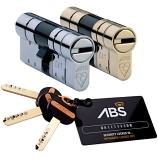 See the Avocet ABS Euro Cylinder Door Lock Barrel page for details. We supply hardware to repair most double glazed UPVC windows and doors fitted over the last 30 years. We aim to despatch the majority of orders the same day; we understand that broken hardware needs replacing as quick as possible. We hold good stock levels of all our products, rarely do we run out of stock. Here at UPVC Hardware we specialise in supplying hardware for repair and maintenance of UPVC windows and doors. 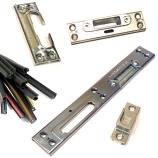 Some of our hardware is often fitted to timber or aluminium windows, doors and patio doors. Door and window handles sometimes suffer mechanical failure and need replacing. However it can be be beneficial to renew handles simply because they look outdated and tired. Replacing UPVC handles can give a new look to older windows and doors. 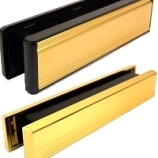 You can find replacement uPVC window handles or uPVC Door handles in our UPVC Handles section. 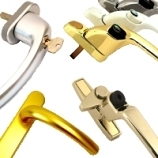 Competing hardware manufacturers have produced a huge range of window and door locks over the years. Unfortunately there is no such thing as a 'standard' lock. We outline the key measurements and features to help our customers identify and purchase a suitable replacement lock. 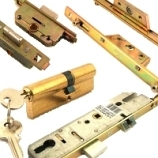 To view our replacement uPVC window locks and uPVC door locks., visit our Lock section . 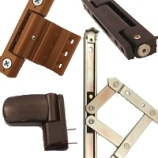 Looking for replacement uPVC window hinges or uPVC Door hinge? 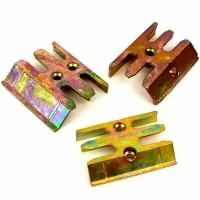 Visit our Hinge section for more details. If you can't find what you are looking for, please send an email with as much technical information as possible: purpose, dimensions, colour, and any letters or numbers printed on the product. A digital photo of the failed product is useful for identification. Please ensure that you have checked the website for your product first because it is extensive. We pride ourselves on being able to supply our customers with an extensive range of hardware in the UPVC hardware industry. Discounts are available for multiple purchases of each item, please contact us with your requirements. For technical help and sales, don't hesitate to contact us. Our website has been designed to be as user-friendly as possible. Due to the nature of the industry, there are hundreds of components available. We explain in detail how to identify a suitable replacement part so that you can 'get it right' first time. However if you can't identify the window or door part required from our website, contact us by phone or email and we'll try our best to help you. We sell direct to the UPVC Double Glazing repair industry as well as private individuals. If you are a bona fide trade customer, open an account on this website, then contact us to establish your trade status. We'll record your account as a trade one.